God knows how I love history. On the second day here, to our amazement, we realized He has situated us in a powerfully rich historical section of Aswan, Egypt, and even more specifically, right next to an ancient Nubian village of Aswan. Aswan actually means “gateway”…it has always been a gateway city. Three of the four books I wrote are historically-based. The book on the Mahdi, the Islamic Messiah, is particularly focused on Egypt for some of its elements. Two books that I used for research on the Mahdi have been banned here in Egypt: The Blue Nile and The White Nile. Why were they banned? Because the content of these two books deal with the conquest of Egypt by the French under Napoleon Bonaparte and again by the British under General Charles Gordon. The Egyptian government may have looked at these books as some kind of propaganda biased against them. The White Nile review is compelling: “Relive all the thrills and adventure of Alan Moorehead’s classic bestseller The White Nile––the daring exploration of the Nile River in the second half of the nineteenth century, which was at that time the most mysterious and impenetrable region on earth…[This book] capture in breathtaking prose the larger-than-life personalities of such notable figures as Stanley, Livingstone, Burton and many others. The White Nile remains a seminal work in tales of discovery and escapade, filled with incredible and historical detail and compelling stories of heroism and drama.” Needless to say, it is a good read. Just this week I took a walk to explore my neighborhood here in Aswan. Our community is very near to the High Dam. My initial intent was to pray around our nearest mosque at the time of their evening prayers––around sundown. As I walked around the mosque only a block from our apartment––praying the Muslim worshipers would encounter God through dreams and visions of Jesus of Nazareth––I realized we are perfectly situated at the edge of a Nubian village on the east bank of the Nile. I ventured into the village in my usual bold happy manner and was hailed down by a young Nubian man. “Hello!” Mizo greeted me. “What you need? Can I help you?” He offered his assistance to find what ever had brought me to his village. “I know the Nile River is very close to here…Can you show me how to get there from here?” I asked my new friend. “Sure! Let’s go.” Together we wound our way through his neighborhood to the river. There, falukas (Nubian sail boats) dotted the bank. The sun was low in the sky and the atmosphere was theatrical––the Nile gilded by the golden setting sun. I breathed in deep pleasure at the panorama before me. Then Mizo dropped the bombshell. “This is a very ancient Nubian village…” He went on to explain to me that his village was actually the transit camp where explorers had to leave their ship excursions and proceed on foot up the mountains through which the Nile cascades down to level ground headed to the Mediterranean. The history that I knew so well almost embraced me physically as I stood there taking it all in. I could see the explorers who had stood in this very spot. General Charles Gordon climbed into Sudan unknowingly to his death at the hands of a self-proclaimed Mahdi in the 1800s. I knew he had to have stopped here. There are two movies that tell the story: “Khartoum,” starring Charlton Heston, and “The Four Feathers,” a modern remake of an English movie. I highly recommend both of these movies to appreciate the backdrop of our present location here in Egypt with its amazing history. By the way, General Gordon is the same General stationed in Jerusalem for which “Gordon’s Calvary” is named. His reputation was that he fought with a weapon in one hand and the Bible in the other. A BBC documentary called “The Sign and the Seal” explores the possibility that the Ark of the Covenant of the Jews being exiled to Egypt in troublesome times and resting here in Aswan on Elephantine Island before danger drove it on to Ethiopia to Lake Tanna. The truth of the story is questionable, but a Jewish community did, in fact, exist here at this historical junction on this historically-famous river. The ruins of a temple––its dimensions exactly matching those of the Temple in Jerusalem––rest, in part, on Elephantine Island. It is the only place outside of Jerusalem where an exact replica of the Temple existed. We now join explorers of another kind. The desert surrounding us drew famed mystics of the early Church called the “Desert Fathers” who sought solitude and freedom from everyday life. They had a passion know God apart from the mundane and their desire drove them into the desert to seek the very face of God. We believers of the Modern Church represent a new breed of explorers––those invited by Heaven to explore the mind of Christ in which we encounter a universe of possibilities beyond earth’s natural order and restrictions. 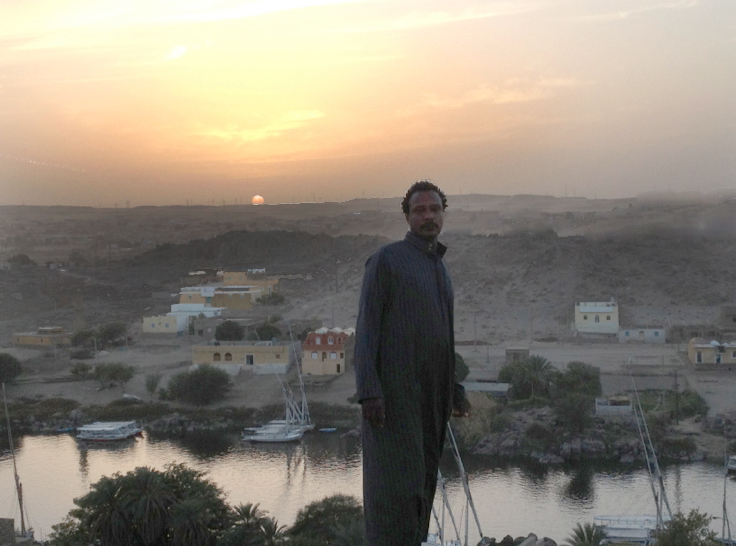 Yes, Aswan is a gateway–a door of exploration to northeast Africa and beyond. Since our arrival here in Aswan, Carol and I are discovering a refreshing and uncommon friendliness of the Egyptians. There is an absence of suspicion and anger that we have experienced in other neighboring nations. It is easy to envision God doing a great work here. As I was before the Lord one morning, I had a stunning revelation about the majesty and sovereignty of our God. The fact of the matter is that all forces tremble in the face of the Master of the Universe. No god, demon, or idol can rise up because He is the highest Sovereign. That is good to keep in mind in our present surroundings. One can fall victim to untruths about facts on the ground if not careful to keep perspective. This truth has held me in a place of peace, rest, and great joy as I have stood to proclaim God’s intents toward this great and ancient nation whose genetics are signs, wonders, and miracles. God demonstrated better supernatural demonstrations of His own power through His servants He sent here. He loves the Egyptian people and is still going after their hearts to this day. Heaven’s seeds of fire have been hosted here repeatedly and the residue is still evident––Abraham, Isaac, Jacob, Joseph, Mary and Joseph, Jesus, the Apostle Mark, the Desert Fathers, and many more. And, with the Scriptural decree in Isaiah 19, “Blessed be Egypt My people…” God has decreed ownership of the Egyptians with His blessing and we are His servants here now to see those declarations be manifested. The cloak of Islam forced upon Egyptians––once a Christian nation––will be thrown off and Jesus will be proclaimed Lord and King here once again. Our first week here has been more than expected…above and beyond. We stand to decree what the Father decreed over this nation: a future, a blessing, a return to better times and stability for believers here. We believe it lies in the hands of His servants to take territory back and reinstate Egypt’s heritage under the Wings of the Master. We are here to lift the arms of the warriors who fight here­­–spiritual giants who only see God’s goodness and all that He has promised to them. It is needless to fall into untruth by apparent situations on the ground. We are the ones who have the power and authority to change things. One can feel Egypt responding in kind to a brazen faith––a crazy faith––that is bold enough to simply believe God in this hour.